The 2019 Calendar Competition opens on 20th April. 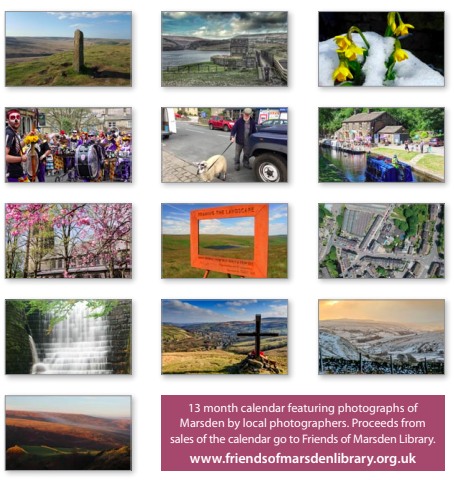 Funds from selling the calendars produced go to Friends of Marsden Library to support our local library with events, awareness raising and volunteer support. The calendar raised more than £2,000 this year, and we can’t do it without you. NEW for the 2019 Competition: we are introducing a youth category. Contestants aged 18 or under will be considered in a separate category, so please encourage entries from any young people you know. The judges are looking for interesting pictures that capture the spirit of Marsden and the Colne Valley. You don’t have to be a professional – everyone’s in with a chance. And if you have pictures featuring people that might well increase your chances of winning, as we have far more submissions of scenery than we do of people. Don’t forget to make sure your picture is in the horizontal format. Vertical pictures don’t work on the calendar. You’ve got until midnight on 30th June – Good Luck!